Fennoscandia (Finnish: Fennoskandia; Swedish: Fennoskandien; Norwegian: Fennoskandia; Russian: Фенноскандия Fennoskandiya) or the Fennoscandian Peninsula is the geographical peninsula comprising the Scandinavian Peninsula, Finland, Karelia, and the Kola Peninsula. It encompasses Finland, Norway and Sweden, as well as Murmansk Oblast, much of the Republic of Karelia, and parts of northern Leningrad Oblast in Russia. Its name comes from the Latin words Fennia (Finland) and Scandia (Scandinavian). The term was first used by the Finnish geologist Wilhelm Ramsay in 1898. Geologically, the area is distinct because its bedrock is Archaean granite and gneiss with very little limestone, in contrast to adjacent areas in Europe. ↑ Sten Lavsund; Tuire Nygren; Erling Solberg (2003). "Status of moose populations and challenges to moose management in Fennoscandia". Alces. 2003. HighBeam Research. ↑ "Fennoscandia [fen′ō skan′dē ə]". Your Dictionary. LoveToKnow, Corp. Retrieved 20 April 2015. ↑ De Geer, Sten (1928). 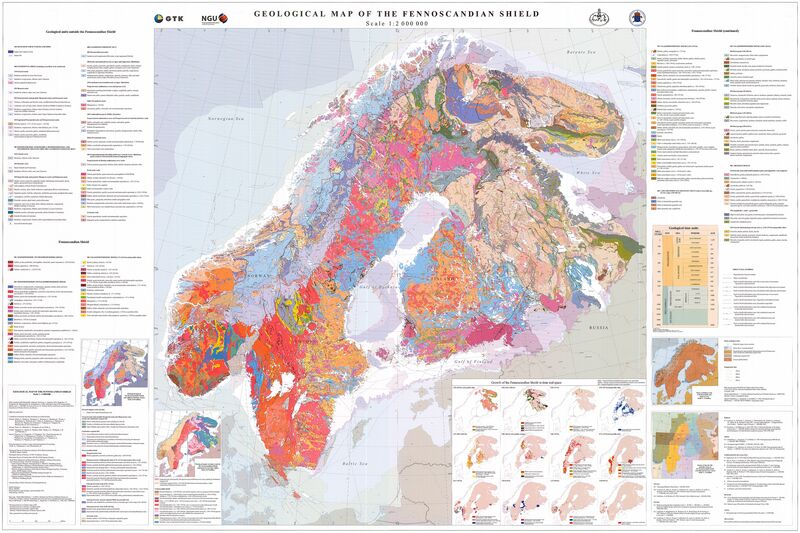 "Das geologische Fennoskandia und das geographische Baltoskandia" (PDF). Geografiska Annaler (in German). Swedish Society for Anthropology and Geography. 10: 119–139. OCLC 604361828. Retrieved 22 April 2018. ↑ Bulletin - Canadian Library Association, Volume 20. Canadian Library Association., 1963. p. 179.